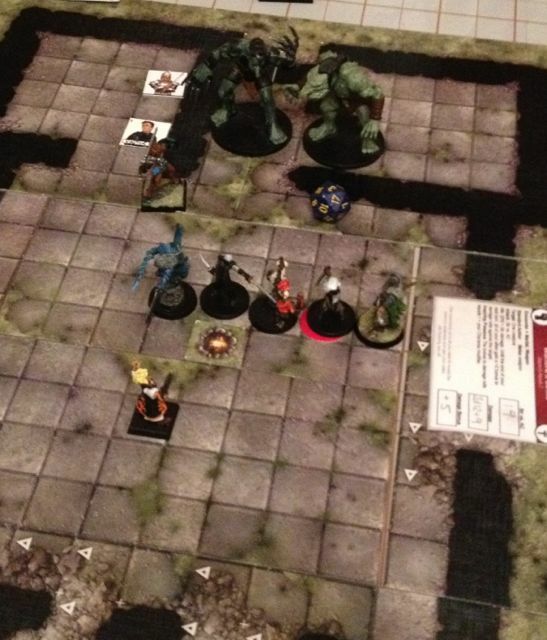 Here’s what happened in last night’s game – stopping the attack on Moonstair will have to wait for next session! Each PC gets 1,610 xp. Unable to leave the Great Warren until it’s light, the PCs decide to do some more exploring, leaving Bax behind. They head south from the forge and down some rough hewn steps. Hrothgar listens at the door ahead and can hear the sounds of stones being banged together. He gives it a shove with help from Juma Ji’ad, and it flies open, revealing a dark cavern with a sinister-looking stone altar to Torog and tree roots growing down through the ceiling. A grimlock sits on the floor. Gil comes forward with his light spell so the PCs can see, illuminating half a dozen more grimlocks and an underground stream. Before the PCs can charge into battle, they are blasted by a psychic storm of alien energy from an unseen assailant which dazes a couple of the party. Ulthar uses his cloak to go insubstantial and flies past the grimlocks as Hrothgar, Sora and Juma wade into melee. Gil turns himself into a fiery figure and uses his fire shroud to devastating effect, taking out most of the blind humanoids. Unfortunately, he is then unable to do much else for the rest of the fight because he doesn’t have more fire spells! Hrothgar gets hit for 61 hp damage by a critical hit from a grimlock berserker as he and Juma battle on top of the escarpment with the altar. Amazingly, Juma’s dwarf wall of fire finishes off the frenzied humanoid, admittedly after quite a few hits from the gnoll first. Meanwhile, Sora disposes of her opponent by the entrance, allowing the party to move across the stream to where another berserker and the unseen psychic attacker await. The latter is a grell philosopher, capable of attacking with paralysing tentacles, a blinding lightning lance (which it uses on Ulthar and Juma) and with psychic tendrils that cause the PCs to attack their allies instead of their enemies. The grimlock is no pushover either, and a vicious axe swing takes Hrothgar down to -45 hp! Luckily Gil is on hand to bring the gnoll round with a potion of healing, but he soon goes unconscious again from the grimlock’s crazed attacks. The grell is an annoying opponent, flying out of reach, forcing Juma to use his lightning lure to bring him down to earth several times. Finally, though, the concerted efforts of the party bring down the aberration and his bodyguard. By this stage, all the PCs are low (or out of) healing surges, and have exhausted all their daily powers. The grell has several strange grey crystal cocoon like structures in its lair which Juma decides to smash open with his longsword, getting splashed with the liquid contents of the first one (which makes him feel odd), then finding six amethysts and some elven boots in the second and third. Hrothgar opens the next two more carefully – they have alchemical reagents inside that can be used for rituals, but he can’t stop Juma smashing the last one. Splashed again, the genasi shrinks down to six inches in height, much to the amusement of the rest of the party. After searching around, the PCs head to the dragon’s lair to wait for first light. When dawn arrives, they head off for Moonstair, using the map of unseen lands to guide their steps. After walking for a few hours, they rest in a secluded spot to recover their strength. Gil studies his spell book and his dispel magic spell brings little Juma back to his normal size. The genasi is still feeling odd though. At 4pm, they head off again, reaching the ruins of Orrak near the end of the day – the map has revealed that these ruins are home to an unspecified “significant threat” so the PCs approach cautiously. Hrothgar pulls aside the skins serving as a makeshift curtain over the doorway to a ruined building that appears occupied. Inside are three drow elves, sitting around a fire. Several eladrin captives can be seen chained up in the room beyond. Battle is joined with the drow using poisoned hand crossbows and rapiers to weaken the party. 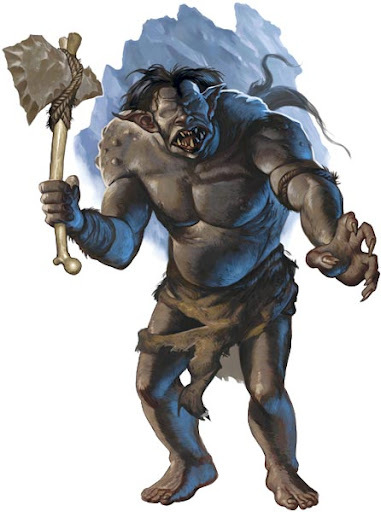 They go down fairly easily but are not alone – two bladerager trolls are also in the ruin. These prove more capable opponents and surprise the PCs by exploding when killed. With their enemies slain, the PCs free the four eladrin who have been come through the Moon Door from the Feywild city of Celduilon to help against Skalmad. A fifth member of their group has died under torture from the trolls; his scale mail is given to the PCs by the eladrin leader, Pyvanel, in gratitude for their rescue. Searching the drow reveals papers implying the dark elves were sent by the Matron Mother of the city of Dol Felazzan to reinforce their alliance with Skalmad. The documents hint that the city is under threat from rival drow.